My daughter is a lazy child. That is a fact. She just didn’t want to walk and preferred sitting all the time. When she was 13 months old we decided to buy her a toy that will motivate her to walk – and this was like hitting the jackpot! Less than a week or so strolling around with this walker and she was confident enough to let go and completely started walking on her own. 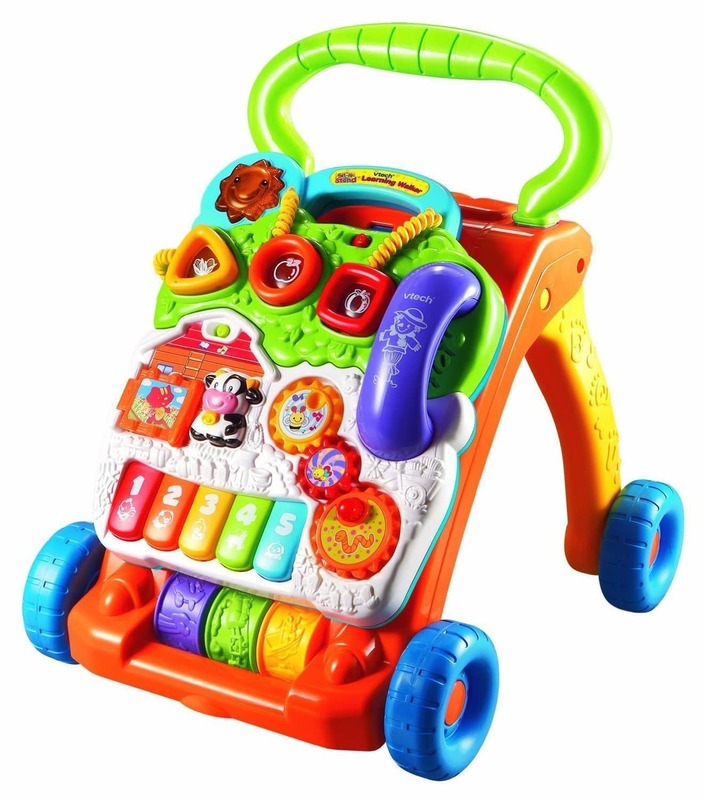 VTech Sit-to-Stand Learning Walker is full of activities for a growing baby and toddler. There are two settings – a learning mode and a music mode. This walker has so much activities for the little one as it plays music and keeps them entertained for a good amount of time. It has shapes, colors, animal sounds, a small piano, open/close door, gears, a phone..and it’s also a walker. I can honestly say that this toy was instrumental in helping her to walk. She pushed this toy all over the house day and night. It has lots of interactive features and my daughter loves it. The front face comes off so she can also sit on the floor with it and play. She still play with it now here and there at almost 2. I am usually really clumsy when it comes to putting things together, but this one was extremely easy to put together and the toy came with its own batteries, which is great. Before buying it, I read some bad reviews about sliding on the wood floor, but that wasn’t true. It does NOT slides on the wood floor. It has some rubber on the wheels and it makes it very comfortable to use. One bad side of this product is that it has over 70 sing-along songs, music, sound effects and fun phrases. And trust me, you will get bored listening to them all day long. But hey, it’s for our kids, so we can deal with happy songs. I think we would all love to have something like this when we were young! Click here to buy the product on Amazon. *And just for full disclosure, there are affiliate links in VTech Sit-to-Stand Learning Walker Review. This means that I’m sharing something that I think is helpful, and if you make a purchase through the link, I earn a little bit back. No extra cost to you, and just a little help for me to pay for the blog expenses. Haha1 Only 70 songs, huh? What did our parents do with the toys that played one song endlessly??!! hahaha, yes, so true! We are complaining about something that we should be happy about. Modern times!